I'm Pat with reminiscejewel I love sewing vintage inspired, boutique dress form displays. 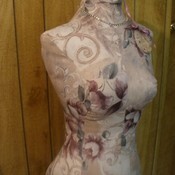 Life size torso designs are great attention getters, as home decor, boutique and antique store window displays. Available in modern and vintage prints. Great to display antique jewelry, shalls or clothing. Completely stuffed firmly and adorned with glass, metal or wood knob that adds to the style of fabric print. May be ordered with or without solid wood stand. reminiscejewel doesn't have any items in their booth!